You have places to go and people to meet, so don't let outfit selection slow you down. Slinky resolves your "what-to-wear" dilemma with a 2-piece ensemble that's comfortable, stylish and versatile. 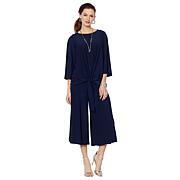 Wear this tunic and pant set together or mix and match with other pieces in your wardrobe for easy looks that are always ready to go! 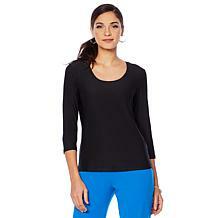 Fit: Top - Fitted: Designed for 2 to 3 inches of ease between body and garment. Measures 2 to 3 inches larger than the fit-critical body measurement. Slightly more relaxed than a close fit, still outlines figure but not tightly. 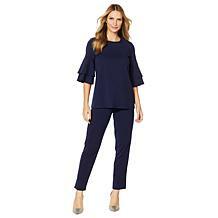 Pant - Semi-Fitted: Designed for 3 to 4 inches of ease between body and garment. Measures 3" - 4" larger than the fit-critical body measurement. Somewhat close to the body, but cut for ease of movement and fabric drape. 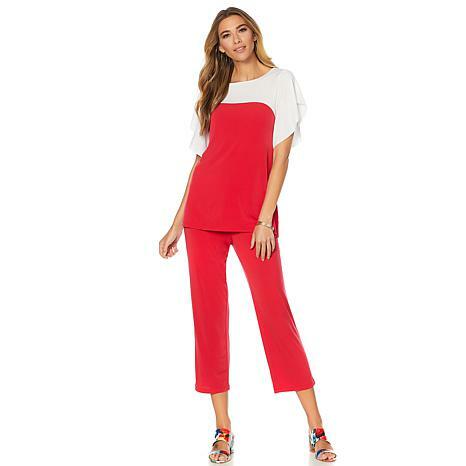 Love the Slinky Brand 2 pc Colorblock Tunic and Crop Pant Set. Love this set, Fits perfectly! I am 5ft and ordered the small. Wanted the Black and White set too but they were sold out. I'm petite but this hits me right above ankle and top not too long. Fabric is great. This is a very nice outfit for summer. I received several compliments. The sleeves are just right. I would recommend this outfit for any summer function. I wore the navy blue set yesterday for the first time and have NEVER received so many compliments! Men and women alike expressed how nice I looked! Better than that is how light and comfortable it is. I just ordered it in another color.